Democratic presidential candidate Hillary Clinton has called for new sanctions on Iran over its recent ballistic missile test. Her comments come as earlier economic sanctions are being partly lifted, after Iran fulfilled measures set by the nuclear deal. “Iran is still violating UN Security Council resolutions with its ballistic missile program, which should be met with new sanctions designations and firm resolve,” Clinton said in a statement. The former US secretary of state stressed that if she is elected president this year, she will take on Iran with a “distrust and verify” attitude. Latest media reports indicated that a detained American student, Matthew Trevithick, has already left Iran, while “logistical steps” are in process to send four other prisoners, including the jailed Tehran bureau chief for the Washington Post, Jason Rezaian, home. While lashing out at Iran for its missile tests, Clinton has apparently been fine with weapons being sent to some of its Middle Eastern neighbors, despite them being criticized for dismal human rights records. Amid Clinton‘s presidential campaign, media reports have surfaced claiming that regional players, including Saudi Arabia and Qatar, have donated billions of dollars to the Clinton Foundation. At the same time, those same nations had weapons deals approved by the US State Department when it was headed by Clinton. “Algeria, Saudi Arabia, Kuwait, the United Arab Emirates, Oman and Qatar all donated to the Clinton Foundation and also gained State Department clearance to buy caches of American-made weapons even as the department singled them out for a range of alleged ills, from corruption to restrictions on civil liberties to violent crackdowns against political opponents,” International Business Times wrote in May 2015, citing a review of available records. Meanwhile, US Democratic Senator Richard Blumenthal joined Clinton’s call for more sanctions on Iran on Saturday, arguing its missile tests violated UN resolutions. “Without delay, the United States should enforce sanctions on Iran for its ballistic missile program,” Blumenthal said. Both Clinton’s and Blumenthal’s statements come as international economic sanctions imposed on Iran earlier due to suspicions that its nuclear program was being used to develop atomic weapons were formally lifted after the UN nuclear watchdog – the International Atomic Energy Agency (IAEA) – released a statement saying Iran has fulfilled all of the measures required under its deal with six world powers. The JCPOA, known as the Iran nuclear deal, was signed between Tehran and six world powers (the so-called P5+1 group comprised of China, France, Russia, the UK, the US and Germany) on July 14, 2015. The deal entailed Iran shrinking its atomic program in return for the US, EU and UN lifting economic sanctions. Secondly, Jewish Supremacists persist in claiming ‘racial credit’ for the achievements of individuals who have publicly renounced, denounced and distanced themselves from Judaism and have dismissed any notion of Israel as their spiritual homeland. Their universal prestige has prevented them from being labeled, apostate or ‘self-hating.’ Albert Einstein, often cited by the Supremacists as the supreme example of ‘Jewish genius,’ denounced Israel’s war crimes and showed disdain for any tribal identity. In their era, Marx and Trotsky, like the vast majority of emancipated European Jews, given the chance, became engaged in universalistic organizations, attacking the entire notion that Jews were a ‘special people’ chosen by divine authority (or by the latter-day Zionists). After all is it Jewish ‘genius’ that makes Israel a leading exporter of arms, high tech intrusive spy systems and that sends military and paramilitary advisers and torturers to work with death squad regimes in Africa and Latin America? Among the winners of the Nobel Peace Prize are three Israeli Prime Ministers who waged wars of ethnic cleansing against millions of Palestinians and expanded racist ‘Jews only’ settlements throughout the occupied Palestinian territories. These include Menachem Begin (notorious career bomber and terrorist), Yitzhak Rabin (a militarist who was assassinated by an even more racist Jewish terrorist) and Shimon Peres. Among Jewish American Nobel ‘Peaceniks’ is Henry Kissinger who oversaw the brutal and illegal US war in Indo-China causing 4 million Vietnamese deaths; who wrote the ‘template for regime change’ by overthrowing the democratically elected government of Chilean President Allende and condemned Chile to decades of police state terror; and who supported Indonesia’s destruction of East Timor! In other words, these Nobel recipients, who Supremacists cite as ‘examples of Jewish Supremacy,’ have sown terror and injustice on countless captive peoples and nations – giving the Nobel Peace Prize a dubious distinction. Donations from financial billionaires, all ‘geniuses,’ have financed the war crimes of the Israeli state and made possible the expansion of violent Jewish settlers throughout occupied Palestine – spreading misery and displacement for millions. The latest fashion among Jewish Supremacist ‘geneticists’ is to extol the discovery of uniquely special ‘genes’ predisposing Jews to experience the ‘holocaust’ and even inherit the experience of suffering from long dead ancestors. Such ‘scientists’ should be careful. As Jazz artist and essayist, Gilad Altzmon wryly notes, ‘They will put the anti-Semites out of business’. Although one of the first lessons anyone learns about the Internet is to be cautious about what you find there, Higgins andBellingcat relied on the images to conclude that this battery was dispatched from Russia under the command of Russian forces. The bloggers went so far as to send a list of Russian soldiers’ names as suspects to the MH-17 criminal investigators. One of the tasks that we clearly have is to rebuild trust in our political system … it’s about making sure people are in control and that the politicians are always their servants and never their masters. Greater transparency is at the heart of our shared commitment to enable the public to hold politicians and public bodies to account. If there’s one thing I’ve noticed since doing this job, it’s how all the information about government – the money it spends, where it spends it, the results it achieves – how so much of it is locked away in a vault marked sort of ‘private for the eyes of Ministers and officials only … By bringing information out into the open you’ll be able to hold government and public services to account. In fact, the only transparency is Cameron — you can see right through him. In August last year two British nationals fighting in Syria were killed in British drone strikes, they were Reyaad Khan and Ruhul Amin, the latter not a “formal” target but killed anyway. Whilst many may be tempted to think “terrorists, serves them right”, this is the thin end of a very dodgy legal wedge. An illegal strike on a sovereign country, killings with no recourse to law – and only the government’s word on who they killed anyway, there will surely never be absolute proof. Moreover, for all the word juggling, it seems Cameron’s government has followed in the footsteps of their Master, Barack Obama, and had the UK National Security Council draw up a “kill” list. … our job is to … identify the terrorists and where we can forestall them. But if you’re asking me would we hesitate to take similar action again today, tomorrow, next week – absolutely not, we would not hesitate. Cameron seemingly morphs ever more into his hero Tony Blair – even down to seemingly having a compliant Attorney General in Jeremy Wright, QC. Few will have forgotten Blair’s, Lord Goldsmith, who changed the advice on the Iraq invasion from illegal to legal at a gentle tap on, not even a twist of, the arm. Members of the UK’s Parliamentary intelligence watchdog will not be allowed access to all intelligence or defence information relating to the new British practice of targeted killing by drone, the Prime Minister has said. David Cameron was asked today by Andrew Tyrie MP whether the Intelligence and Security Committee (ISC) would be allowed to examine the military aspect of the targeted killing programme, and whether he would commit to the Committee’s security-cleared members being able to see all the relevant intelligence. Mr Cameron refused on both points, stating that the ISC’s job was to examine intelligence, not military affairs, and that he could not give the commitment Mr Tyrie asked for regarding the Committee’s access to intelligence. Mr Tyrie pointed out that what the Committee is allowed to see remains under the control of the Secretary of State, and that its work on targeted killing ‘could be rendered meaningless’ if it were barred from looking at the military operation. In fact, the Government is under a legal obligation to formulate and publish a clear and unambiguous policy, especially when we’re talking about state killing. Moreover, the Prime Minister’s refusals to share vital information with the ISC raises the disturbing possibility that – much like the controversial US drone programme – UK targeted killing may be beyond accountability and oversight. Law, national and international, is clearly fast becoming a redundant irritant. Britain and America’s acts of terrorism seem ever more blatant and unaccountable. “Why do they hate us?” bleated George W. Bush. Work it out. Obama was elected President in November 2008, and inaugurated in January 2009. From the very beginning of his Presidency, it was clear who the ” was beholden to. According to OpenSecrets.org, Obama’s top campaign donors in 2008 included: Goldman Sachs; JPMorgan Chase; Citigroup; Morgan Stanley; Microsoft; Google; and IBM. Considering Obama’s donors, it’s no wonder that (unlike Iceland) the US has not prosecuted the plethora of bankers and financial institutions that have engaged in fraud for years, and subsequently played a pivotal role in causing the financial crisis of 2007/08. There are also some anomalies in many of the mainstream narratives regarding mass shootings in the US. The tragic shooting in San Bernardino for instance, which the mainstream media claimed was carried out by husband and wife, Syed Rizwan Farook and Tashfeen Malik, appears to conflict with some eyewitness accounts of the attack. Two reported eyewitnesses claim that the shoote were three tall white men wearing military gear. 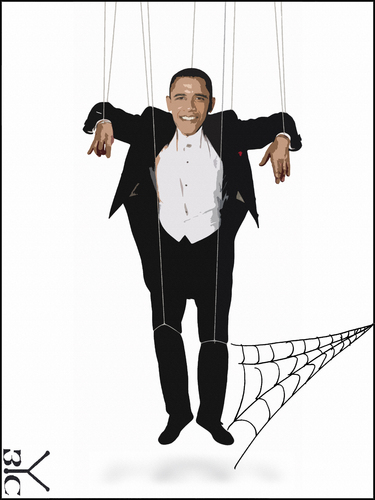 Posted in USAComments Off on Is Obama the Biggest Puppet in History? Venezuela is heading for two confrontations, each reinforcing the other – a political and an economic one. The future is very uncertain. In short, Venezuela is heading towards two confrontations simultaneously, where each threatens to exacerbate the other: one economic and the other political. What the prospects are for overcoming these confrontations is impossible to predict at this moment. Within the chavistasocial movements and the governing party, the PSUV (United Socialist Party of Venezuela), more and more voices are calling on the government to organize a massive consultation process with the grassroots, which is something that Maduro has endorsed, but it remains an open question whether these will happen in time and if it does, whether it will be able to provide solutions that will allow the Bolivarian Revolution to move forwards, despite the reinvigorated opposition in parliament. Nazi occupation authorities (IOA) on Thursday extended the detention of a Palestinian journalist for eight days and slapped a travel ban on the Second Deputy-Speaker of the Palestinian Legislative Council (PLC). A PIC news reporter quoted local sources as stating that the Nazi court at the Jalama lock-up, in 1948 Occupied Palestine, extended the remand of journalist Mujahed al-Saadi for eight days pending further investigation. Al-Saadi, working as a reporter and photojournalist for the Palestine Today TV Channel, was kidnapped by the Nazi occupation soldiers a couple of days ago from his own family home in the occupied West Bank province of Jenin. Meanwhile, the IOA banned the PLC Second Deputy-Speaker, Hassan Khreisheh, from travelling to Turkey via the al-Karama border crossing. Khreisheh was quoted by the Quds Press as saying that the IOA informed him of the ban after he had been detained for four hours at the al-Karama crossing and without specifying the reasons for the ban. MP Khreisheh was on his way to Turkey to take part in a pro-Palestine event. He said the IOA has renewed a travel ban to which he had been subjected to over the past seven years. The MP said such arbitrary bans make part of Nazi attempts to quell anti-occupation voices overseas. Khreisheh slammed the silence maintained by the Palestinian Authority (PA), chaired by Mahmoud Abbas, over Nazi bans on Palestinian MPs.